"We would appreciate it if you could write a reflection about your book, The Road to Frogmore. Your comments should focus on what you found to be most important about your work--share what you found to be most rewarding, most difficult, most surprising, whatever you find to be most significant to your individual experience and the project overall." After a bit of stewing about the prospect of yet another writing project , I realized that I had already written such a reflection as an "Author's Note" at the beginning of the book. So here it is, with only a bit of editing so that the article can stand alone as part of the archive of The Jubilee Project. The Road to Frogmore tells the story of Laura M. Towne, who came to a small island on the coast of South Carolina during the Civil War and almost single-handedly created a school tha could turn former slaves into producive American ciizens. The book is fiction, but its story is true, and its characters are real. How can that be? It is true because it is based on documented historical evidence. It is fiction because I have had to use my own imagination to fill in the blanks within the evidence. There is no shortage of sources material for the story of Laura M. Towne. Laura, like most of her colleagues, kept a diary throughout the first years of her stay in South Carolina. All of her Gideonite colleagues were inveterate letter-writers, and much of their correspondence is still available. As a result, a researcher suffers from an over-abundance of material evidence. Almost every event during the Port Royal Experiment had multiple witnesses and participants. The problem, of course, is that when nine different people write their own descriptions of a particular event, they produce nine different truths—and all of them may be “true.” Truth changes, depending upon who tells the story. the question her diary and letters fail to answer. or her actions. Events are factual; dates are accurate; outcomes fully revealed. Is the story true? and how they must have talked to one another. My greatest challenge came when I tried to portray the slaves who were the heart and soul behind Laura’s story. The slaves of St. Helena Island left no written record of their experiences and feelings. Yet every time I described a crisis point in their story, I knew I was missing an important factor because I had no evidence of how the slaves interpreted the event. At last I chose one individual as a spokesperson for them all. That spokesperson was Rina, the slave woman whom Laura paid to be her laundress. community. In my book, she functions in the same way as a Greek chorus does—watching the action while remaining aloof from it and commenting on the behavior of those who don’t fully understand the culture in which they are embedded. I must add a word about Rina and the language she speaks. Rina, like all of the slaves in the Low Country, spoke Gullah, a language in its own right, with its own rules of grammar, a distinct syntax, and a vocabulary that contained both English words and words from several African languages. It also used certain sounds that a speaker of a European language cannot pronounce. Linguists no longer see Gullah as patois, or a form of broken English. But for that reason, it became a daunting task to reproduce it authentically, while making it understandable for readers of English. it accessible to speakers of English. says “Morrow we gwine go fuh Bufor.” Both are understandable. Apostrophes are unnecessary. forms of going to with the Gullah gwine. bring food fuh we” (not “for us”). to the poetic sounds of an English dactyl. to a b (never becomes neber; very becomes bery). With those adaptations, Rina’s voice rang true, and she was able to speak directly to the reader, putting into her own words the inchoate feelings of her fellow slaves. Hers is the voice that guides the reader down the long road to Frogmore Plantation and the founding of the Penn School. Beaufort County, SC is the second oldest county in South Carolina. This county became what it is do to the blood, sweat, and tears of Gullah/Geechees that toiled in the Sea Island cotton, rice, and indigo fields of the Sea Islands that the county consist of and who worked the phosphate mines and built the buildings. 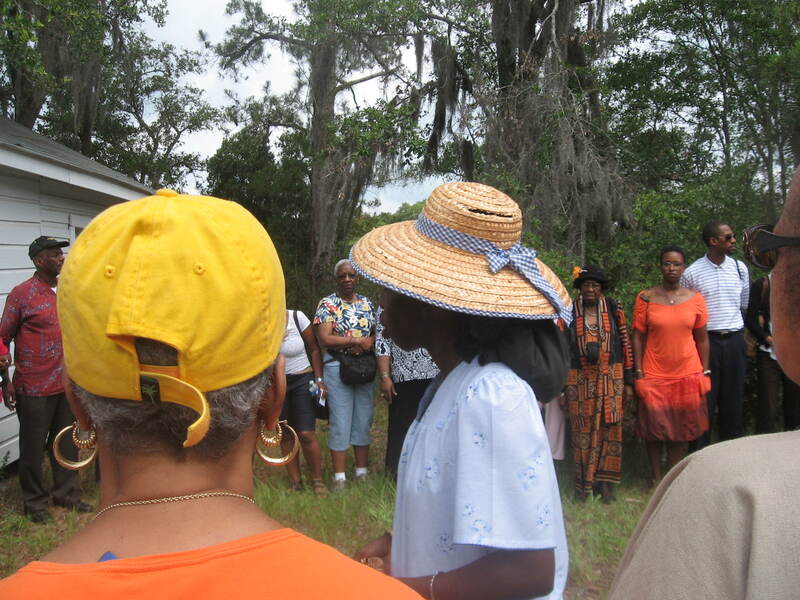 For many generations, the story of Africans that were the architects of the coastal landscape that has become the Gullah/Geechee Nation was buried like so many seeds in the ground. Just as ordered by Divine Law, the seeds that are planted and are nurtured will grow. The Gullah/Geechee seed has grown to be a tree rooted deeply in Sea Island soil by the rivers of water. Heyward House. At this location stands the last of the enslavement cabins built by the hands of our Gullah/Geechee ancestors that dwelled there until they were able to purchase lands just down the road during the Civil War and Reconstruction eras. After leaving Heyward House, take a walk down to the Bluffton Oyster Factory to see a site where Gullah/Geechees have worked and kept up the traditions that theGullah/Geechee Fishing Association is yet fighting for today.Then journey from Bluffton over the bridge to Hilton Head Island, SC and see more Gullah/Geechee architecture by visiting the "Gullah Museum of Hilton Head" which was established by Elder Louise Miller-Cohen. The journey to the Gullah Museum of Hilton Head will help to bring to life and to mind the vision that those who had also built and maintained "Mitchelville" on Hilton Head had. These Gullah/Geechees set out to establish a town that would provide education to their children and provide them with homes. Unfortunately, many of the families of the island have since been displaced and their original homes were demolished. 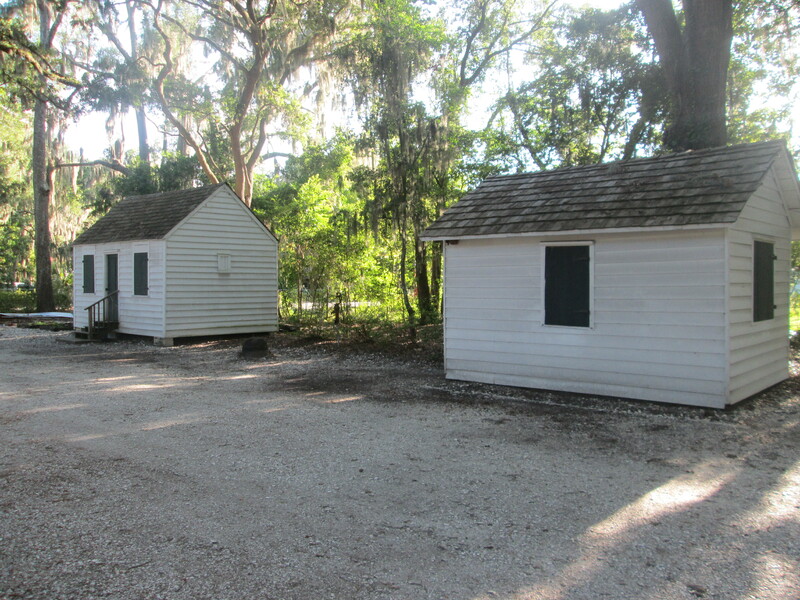 Yet, the Gullah Museum building stands as a testimony to the soundness of building within the spirit of Gullah/Geechees. It also stands as a testimony of how we have been able to endure and how everything that has been touched by the true Gullah/Geechee soul can and will endure and remain standing! In order to see many more homes that have been sustained and maintained by Gullah/Geechees in Beaufort, once can visit the Northwest Quadrant in historic downtown Beaufort. From there, walk over and visit the home of Gullah Statesman Robert Smalls and the buildings that his family helped establish such as the first library for Blacks in Beaufort which is now the University of SC-Beaufort's (USCB) art building. This building is just blocks away from the new location of the Beaufort Visitor's Center which is the site where enslaved Africans were sold in the township. Many of those that had been previously enslaved did as Robert Smalls did and did not settle for this as the only way that they could live. Instead, they fought back and strategized during the US Civil War. They became soldiers in the ranks of the Union Forces. Many of them have been laid to rest at the National Cemetary in Beaufort which was actually created by executive order of President Abraham Lincoln. It took generations before people would know that Gullah/Geechee and other Black soldiers that served were buried there. 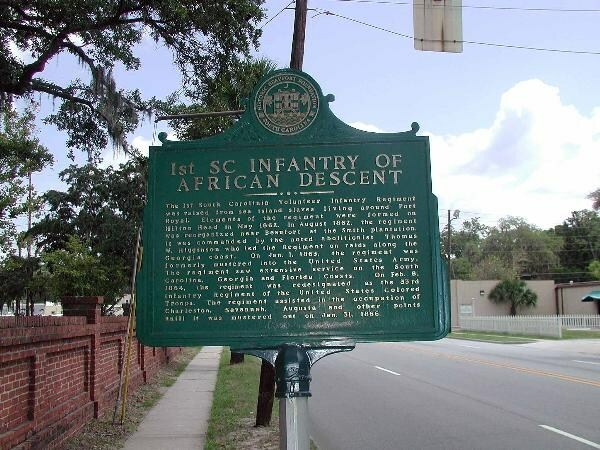 However, there now stands a marker for all visitors that come to Beaufort to see in honor of the 1st SC Infantry of African Descent or the 1st SC Regiment: This marker stands on Highway 21. As you proceed on this highway across the Woods Memorial Bridge, you will journey to and through Lady's Island to historic St. Helena Island, SC. The Gullah/Geechee story continues to be written here daily as the people of the island continue the living traditions of their ancestors through fishing, farming, architecture, quilting, cast net making, boat building, foodways, healing practices, shouting, The Spirituals, and so much more. Disya da de place whey hunnuh gwine see de culcha ebeeday fa tru ya! Many people visit St. Helena Island annually to go to the Penn Center National Landmark Historic District. The Gullah/Geechee Nation International Music & Movement Festival™ participants will be visiting this site including the museum which is named for Dr. York W. Bailey whose home on the island is also on the National Register of Historic Places. 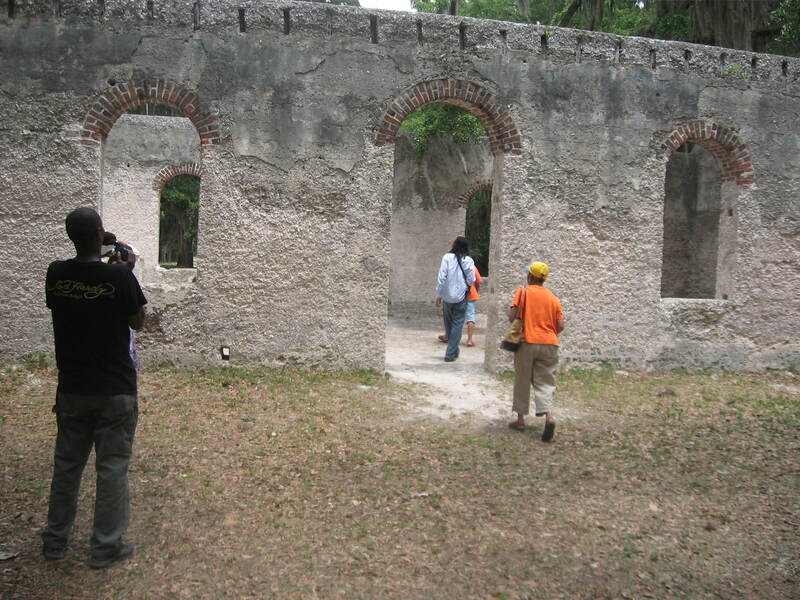 "De Gullah Roots Experience Tour" (www.gullahgeechee.biz) always takes people to these sites and many more on the island is an interactive Gullah/Geechee journey where the history of the Knights of Wise Men Hall, the historic churches, Fort Fremont, the praise houses, and many other historic sites is told. One stop along the journey is another picturesque location that thousands of visitors pull up to each year is the Chapel of Ease which (like Penn School) was built by Gullah/Geechee hands as well. The true journey into ourstory involves engaging with the people and learning the story from the mouths of the Gullah/Geechees that have lived it. However, as you take the time to visit these few sites, sit down quietly beneath an oak tree and tune in with your soul. You will be surprised what you will hear. Le hunnuh spirit opun an hunnuh gwine hab plenee fa share afta a journee een we storee een disya lan a de Gullah/Geechee.